In Omaha, Bellevue, and the surrounding area. Tree work should be done only by those trained and equipped to work safely in trees. Pruning or removing trees, especially large trees, can be dangerous work. 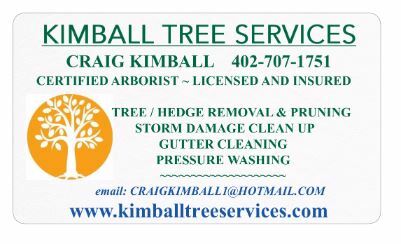 As a Certified Arborist, Kimball Tree Services hold the Required Licenses and Insurance in the cities of Omaha and Bellevue. We are a proud member of the Bellevue Tree Board and continue to seek education to maintain certifications. Committed to providing you with a satisfying customer experience for all your tree service needs. Performing the job in a safe manner, while reducing risk of damage to property. Help decide whether a tree should be removed or determine the type of pruning necessary as poorly maintained, dead or dying trees can be a significant liability. Free estimates to residents and businesses in a responsive and timely manner. Other services offered include: Bush/hedge pruning & removal, General storm damage and debris clean up, gutter cleaning, and pressure washing. If you need it done, and done right, Call Kimball Tree Services today! During the storms, a tree fell on our deck and patio. Craig came out immediately and took care of the problem. He even hauled the debris away. Our family can’t thank you enough!! GREAT JOB! Needed two trees now and one later chopped trimmed a few trees..will call again ..